If you have decided to keep Passover this week then you may be in search of some breakfast inspiration. And if you aren’t Jewish, and you have no idea what matzah brei is or why you’d eat it, stick around. Matzah brei is egg battered matzah that is eaten over Passover. A replica of French toast that is actually very healthy delicious. Passover observants do not eat any bread or leavened products for seven days, which can seem like an eternity without some fun recipes to help you. As an oatmeal junkie myself, I know it isn’t always enticing to be creative for breakfast. Something quick out the door normally suffices. 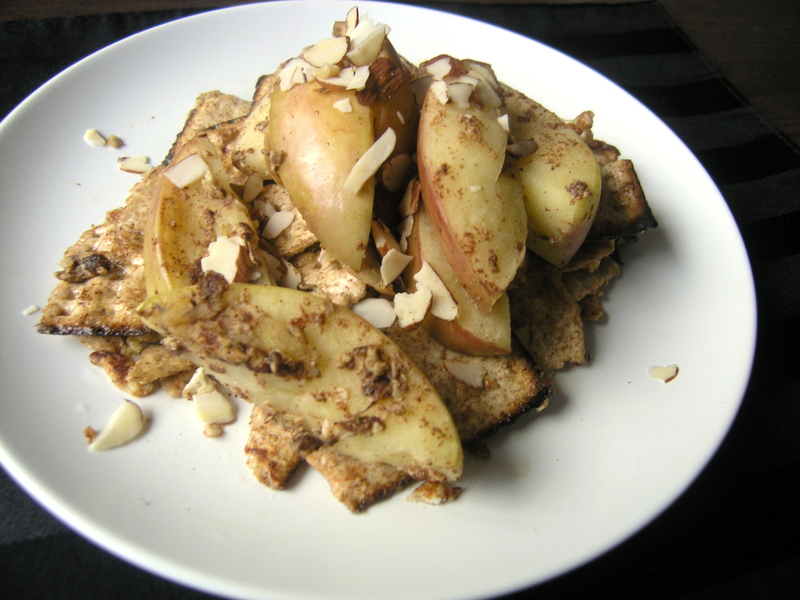 This Apple Almond Matzah Brei might be your answer to a quick breakfast that is intriguing but still healthy. Whole wheat matzah takes on a new form and is complemented by cooked apples and cinnamon. Keep this recipe tucked away somewhere, it may make an appearance long after the holiday is over. Whisk together the eggs, milk, vanilla extract, and 1 tsp cinnamon in a small bowl. Run each piece of the matzah under warm water for about a minute, or until it starts to naturally break apart into large pieces in your hands. Further break into slightly larger than bite sized pieces and put into the egg mixture. Toss around and let stand for a minute so that the matzah absorbs the liquid. Heat a large skillet with a tsp or so of butter on medium-high heat. When the pan is warm, add the soaked matzah while keeping the remaining egg mixture in the bowl. Add the apples to the egg mixture while the matzah cooks. Cook the matzah until the egg is cooked on the outside and starts to brown, about 4 minutes. Remove and place on a dish. Keep covered with a piece of foil. Add the apples to the pan (with more butter if necessary) and cook the apples until they also start to brown, about 4 minutes. You want them tender but still holding their shape. Remove from the pan and place on top of the matzah. Top with sliced almonds and syrup before serving. Follow Cooking in Red Socks! My name is Jamie Lavarnway. Among other things, I am a chef, dog mom, and baseball wife. I post (mostly) healthy recipes that balance out our whirlwind baseball life. Live. Love. Eat. Play Ball!